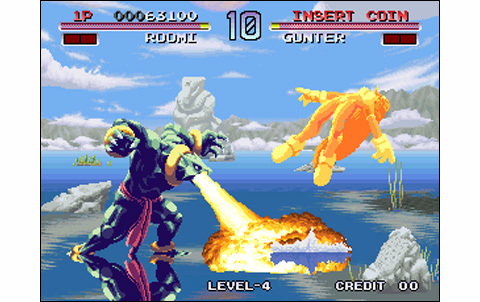 Sunsoft begins on the Neo Geo (95')! Sunsoft is a japanese company who had its golden age during the days of the NES. 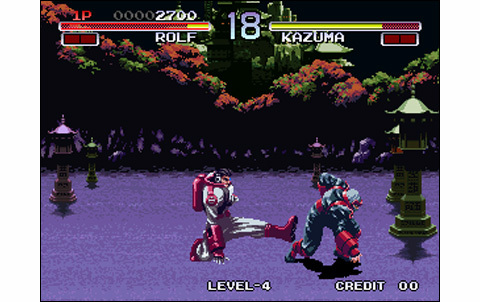 In fact, the firm was regarded as one of the most qualitative in its creations, with titles using 100% of the 8-bits' potential. 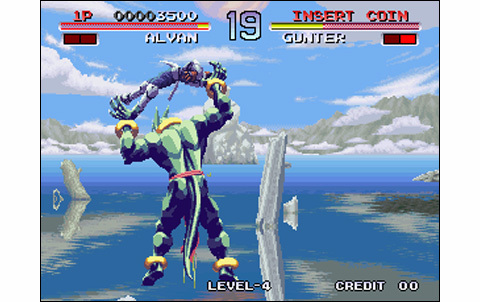 Aficionados probably remember of the fabulous Batman, the excellent Addams Family or the no less legendary Master Blaster... and younger ones (so to speak) of Aero the Acro-Bat, or Final Fantasy Game Boy ports. 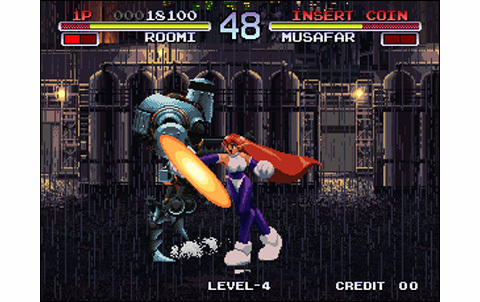 But the company is also the author of remarkable adaptations such as Sega's Fantasy Zone for the NES or ADK's World Heroes for the Super NES, only to mention these. 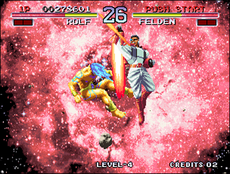 Still, Sunsoft tries its luck on the Neo Geo in 1995 with Galaxy Fight. 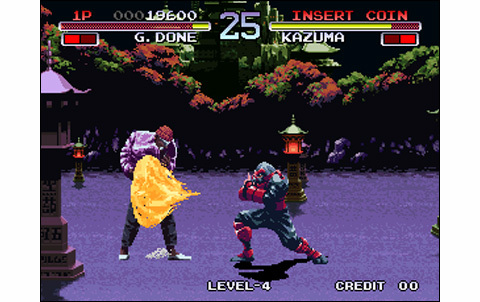 The competition is tough on this system, especially in the field of VS Fighting, since the same year were released Samurai Spirits III, The King of Fighters 95', Kabuki Klash, Real Bout Fatal Fury, World Heroes Perfect... not to mention all the other major titles already available. 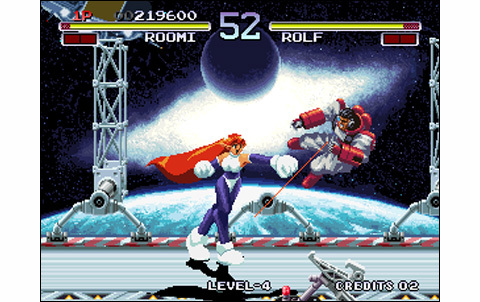 About Galaxy Fight aesthetics, there is nothing much to complain. 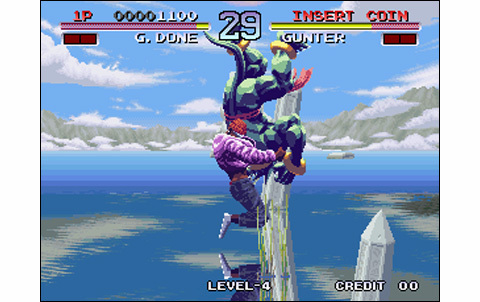 Sunsoft has created varied and original stages featuring very different landscapes, from planets in a system apparently far from ours. Game's arenas have no limits, ie it's possible to get around from one side and the other at will. "3d" effect is applied to the ground, but also on the background, thanks to differential scrollings pretty well managed. 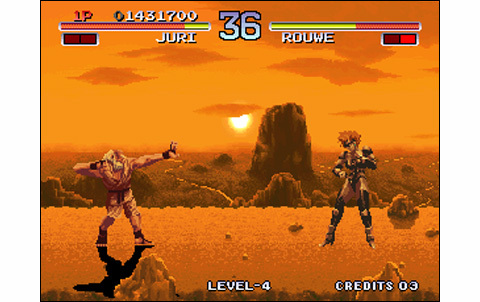 It's certainly far from the visual quality of a Samurai III or any Kof game, but the style is far away from the beaten tracks and it's not bad at all. On the other hand, animation of the game is literally a model of fluidity! The characters have a smooth way of moving, perfectly decomposed and fast enough. Sounds and musical themes are excellent quality, as often with this editor. 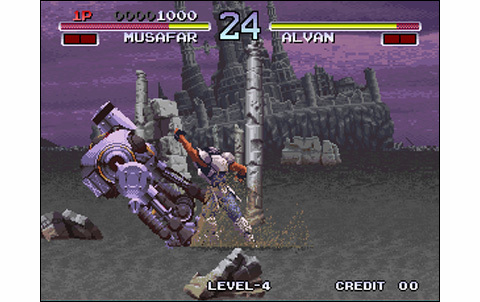 Sunsoft is getting out with honors for its first game on the Neo, and this is a good performance given that the level was set very high by SNK. 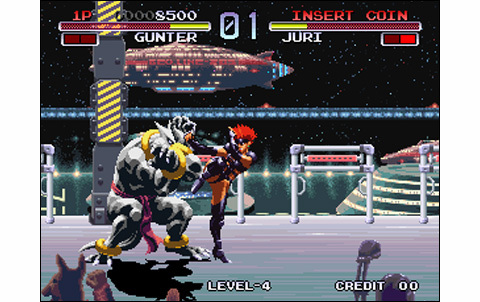 Galaxy Fight's gameplay isn't ripped from any other fighting game, and it is remarkable in itself, given that this is the first VS game of the company. 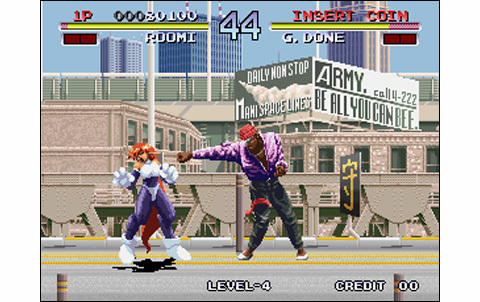 Only three buttons are used for the fight: punch, kick, and powerful blow. 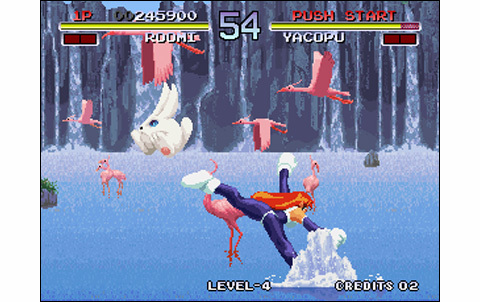 The number of attacks and special moves is average, combos exist but are few, and the game doesn't feature Desperation Moves. This is not totally bad, but it's still a bit bland... we would have loved some degenerate combinations, and especially DM or SDM. In addition, collisions are not hyper-precise while timing of attacks requires a period of adaptation. 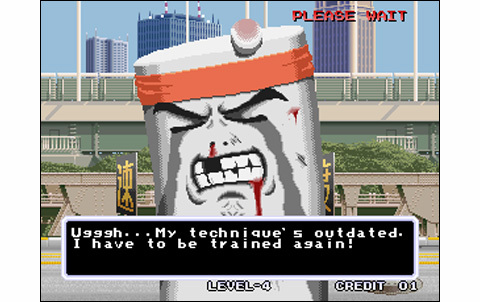 Game mechanics quickly show their limits. 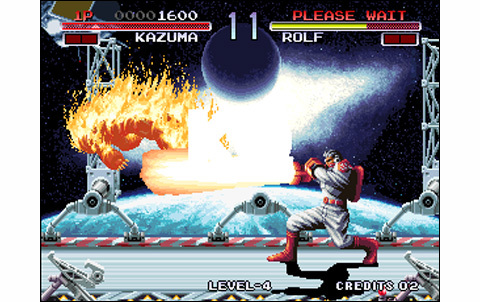 With its very honest realization, its original atmosphere and undeniable fun, it only lacked the essential to Galaxy Fight to become a classic hit on Neo Geo: a much more consistent roster and a richer and more accurate gameplay. 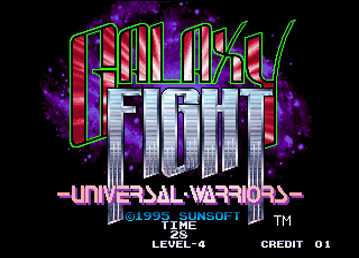 But the ones who love the japanese editor can rest assured, Sunsoft has largely caught up with its second title on the machine right next year: Waku Waku 7! 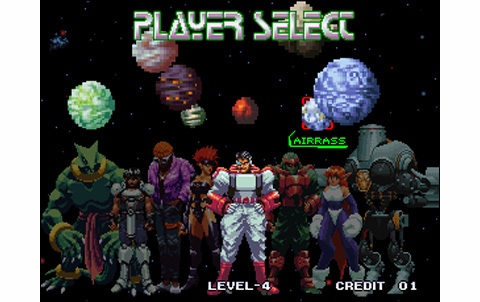 It's not very detailed nor finely drawn, but the various planets offer original stages with some good-looking ones, while characters are well crafted. 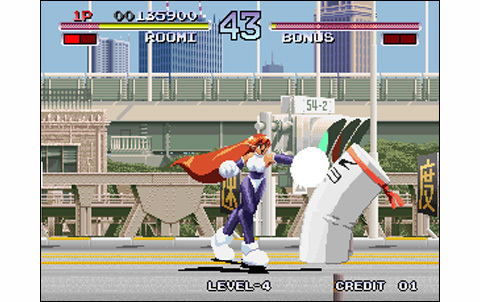 Powerful zooms during fights, smooth and fast action, alive sets, numerous details: that's great! 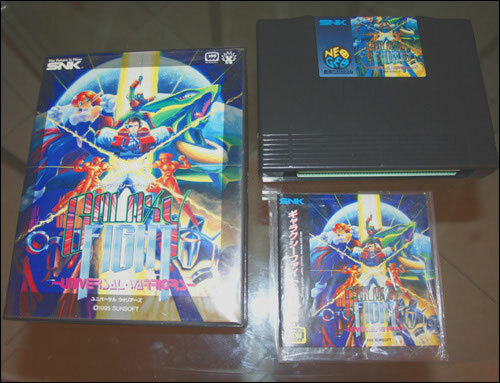 A quality soundtrack, which dares some original things for musics and a range of sound effects pretty decent. Weak! 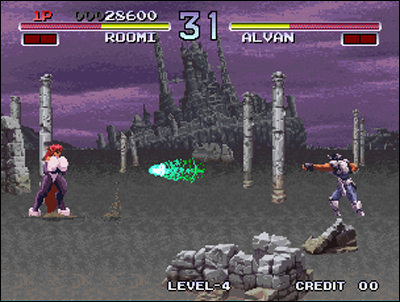 Only eight characters and no depth for the gameplay, you quickly turn around it. A range of attacks, combos and special quite short, and even if we have fun with GF, the game quickly shows its limits. Galaxy Fight is a honorable fighting game, nevertheless far from rivaling with the Neo Geo heavyweights. 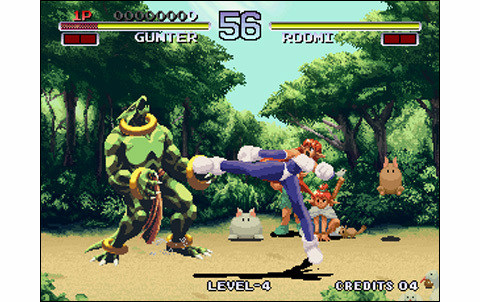 To get Galaxy Fight most of the time you won"t pay more than 80 euros, that is to say the price of a really good Kof episode or a Real Bout Special, only to mention these. So it's very intersting, considering the strong competition on the system concerning VS fighting!